Found these folks at WonderCon too: The Brothers Uber describe themselves as “… an independent, creative publishing company specializing in children’s books. Focusing on art as a gateway to another realm, we pride ourselves on finding the best illustrators and working with them to bring the best books to life.” To that end they have already published several books which you can find at their web site. Of immediate note to furry fans are two: The Dragon and the Princess (written by Erik Peterson and illustrated by Mina Sanwald) is a counting book that also tells the story of a magical friendship between, yes, a dragon and a princess. 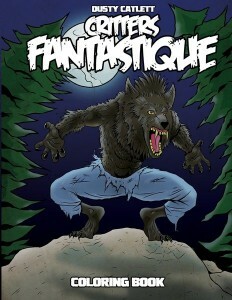 Then there’s Critters Fantastique, a coloring book by Dusty Catlett featuring a variety of legendary creatures and monsters.